The Commons has rejected calls for Parliament's role in a proposed new system for recalling misbehaving MPs to be substantially reduced. Conservative MP Zac Goldsmith tabled a proposal which would have excluded Parliament's standards committee from any role in determining whether errant MPs should face re-election. 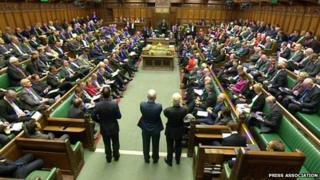 But MPs rejected the idea by 340 to 166 following a free vote in the Commons. Introducing recall powers was a key part of the 2010 coalition agreement. The government-sponsored Recall of MPs bill is being scrutinised in Parliament, after it passed its second reading last week. The bill proposes that an MP would face a by-election if 10% of constituents sign a petition after the MP is found guilty of "serious wrongdoing". The bill has been referred to the Committee of the whole House, meaning its individual clauses can be examined by any MP in the House of Commons chamber, rather than the usual committee of between 16 and 50 MPs. Under the government-backed plans there would be a by-election if 10% of constituents sign a petition after the sitting MP is either sentenced to more than 12 months in jail, or banned from the Commons for more than 21 days. Mr Goldsmith, MP for Richmond Park and North Kingston, has created a rival plan in which MPs are to face a recall referendum if 5% of voters in a constituency sign a "notice of intent to recall" and 20% then sign a "recall petition". Only if all three stages are passed would there be a by-election called. Mr Goldsmith said his amendment would give more power to the public to force a vote but it was overwhelmingly defeated in a Commons vote on Monday. Speaking during the four-hour debate, Mr Goldsmith urged MPs to put aside concerns about the technicalities and cost of recall elections and focus of the principles involved. "What is at stake now is a matter of principle - do we trust our voters to hold us to account or not? "The public today is better informed, better educated, less deferential than at any time in our history. Recall is not radical - it is a mere nod towards those changes." Constitution Minister Sam Gyimah pledged instead to look at a new Liberal Democrat proposal to create an election court process as an additional "trigger" process outside of Parliament but alongside the internal process. "If we are going to have a recall system, we should have a recall system the public can trust, that the public understand, and that the public know when they engage in it, it will actually end in a MP being booted out of this House if need be," he said. The body which hands down bans to MPs is known as the Commons Standards Committee, and is itself mostly made up of MPs. There is some concern that the current bill leaves too much power in the hands of parliamentarians rather than the public. Although Labour back the bill, shadow minister Stephen Twigg said his party would seek to strengthen it. He said: "We need a system that improves accountability and one that gives more power to the public to hold their representatives to account between elections. That, I think, is a matter of fairness." Mr Goldsmith will have the opportunity to propose more amendments to the Bill at the next stage of the legislative process, report stage.